Sometimes it takes an out-of-town audience to fully appreciate our hometown know-how. That was certainly the case for our own Nyle Wadford when he recently traveled to Dayton, NJ, to present a large-format tile seminar to an architectural and design community. 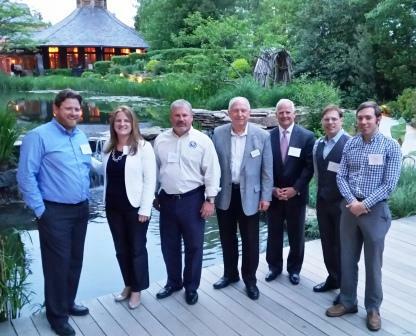 3rd from left, Wadford presented NTCA seminar. The local American Olean & Marazzi USA distributor wanted a special guest to introduce their services to an important client base, and they asked Wadford to present an NTCA seminar on large tiles and participate in a discussion about qualified labor. The hosts and audience said the seminar was “informative and truly helpful,” and Nyle was glad to participate. As a long-time tile contractor and Chairman of the Board of the National Tile Contractors Association (NTCA), Nyle is absolutely passionate about correct tile installations – whether in NC or NJ – he just loves talking tile! The NTCA is an invaluable association for our industry, and, as a Five-Star Contractor, Neuse Tile is able to present its seminars for continuing education credits to the Architectural and Design communities. As NTCA’s 2012 Tile Person of the Year, Nyle is also quite well-known and respected by his peers in the industry (and throughout the country). Neuse Tile has no plans to install tile in New Jersey, but the visit is helping open doors for the NTCA and furthering discussions about proper tile installations, so Nyle sees it as a worthwhile investment of time. And, sometimes it’s also nice to get that ‘out-of-town’ recognition as well. Nyle is also the Vice Chairman of both the NTCA Technical Committee and the ANSI A108 Committee. Great job, Nyle! Categories: Ceramic tile, Tile installation expertise | Tags: Five-Star Contractor, Installation expertise, Local tile expertise, Raleigh tile installer, Tile Geek, Tile leader | Permalink.